One of this summer's most highly-anticipated sequels, Incredibles 2, is shaping up for a huge opening weekend when it hits theaters next month. Early box office projections have put Incredibles 2 at $140 million for its three-day opening weekend when it hits theaters on June 15, and if it does hit that projection, it will break a box office record, surpassing Finding Dory's current mark of $135 million as the highest domestic opening weekend for an animated film in box office history. 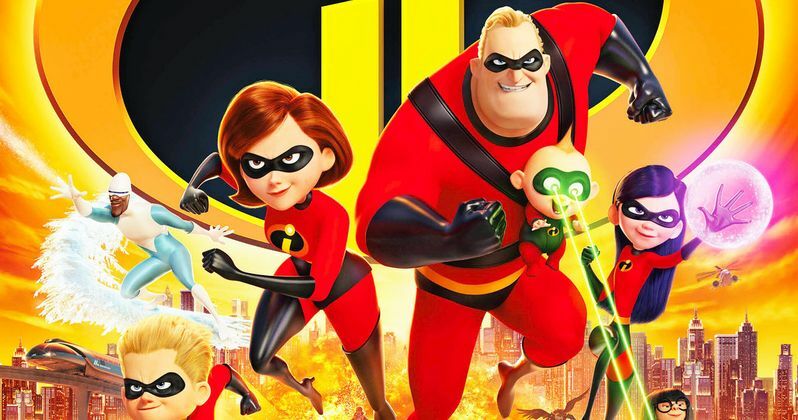 The early projections fall in line with our own summer box office predictions from a few weeks ago, when we put Incredibles 2 at $138.6 million for its opening weekend. It's too early to tell now how wide Incredibles 2 will open at when it arrives in theaters next month, but it will likely have the widest rollout of the rest of the films debuting that weekend, which include Sony's Superfly remake, the Warner Bros. comedy Tag and Yash Raj's action Sequel Tag 3. With this new projection, Incredibles 2 should have no trouble taking the top spot in its opening weekend, whether or not it does or doesn't break the all time animated opening weekend record. If it doe hit $140 million, it will also almost exactly double the opening weekend of its predecessor, Disney Pixar's The Incredibles, which opened to $70.4 million in 2004. The Incredibles ended up earning $261.4 million domestic and $371.5 million international for a worldwide total of $633 million, from a $92 million budget. No budget figures have been released for Incredibles 2 quite yet, but with this opening weekend projection coming in at twice as high as the original movie's opening weekend, this animated sequel could be shaping up for a huge run, especially after the excitement hit when the first trailer debuted. Incredibles 2 also has the advantage of some cushion between some of this summer's biggest superhero movies, arriving seven weeks after Avengers: Infinity War and four weeks ahead of Deadpool 2, both of which won't likely be much of a factor at the box office by then. While Solo: A Star Wars Story is expected to have a solid opening weekend, likely breaking Pirates of the Caribbean: At World's End Memorial Day box office record ($139.8 million), that will also have certainly died down considerably by the time Incredibles 2 hits theaters. The biggest threat to Incredibles 2 will likely come a week later, when Jurassic World: Fallen Kingdom hits theaters on June 22. Its predecessor Jurassic World took in a then-record $208.8 million when it debuted in June 2015, and even if it doesn't match or surpass that mark, it will most likely put up a huge debut that will end Incredibles 2's box office win streak after its first weekend. The Hollywood Reporter broke the news on the box office projections for Incredibles 2, although we'll have to wait and see if these numbers are adjusted when we get closer to the release.